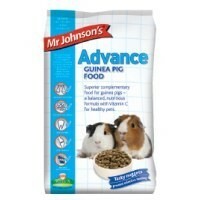 Mr Johnson's Advance Guinea Pig Food is a superior complementary feed for guinea pigs, made in a nugget form to prevent selective feeding. Enhanced with Verm-X and Vitamin C to support overal good health, the tasty food has been developed with a balanced and nutritious formula with added pre-biotics to promote good intestinal health. Mr Johnson's Advance Guinea Pig food also contains additional yucca extract which reduces urinal ammonia and helps to eliminate hutch odours. The food contains no added sugar, colourings, flavourings or preservatives.